Hope Everyone had celebrated this Valentine's day in a wonderful way....Love is in the air and so in the blogs too,all the blogs were so so colorful with those lovely special dishes and themes for the valentines day..
Usli is one of those traditional dishes of Karnataka people and is prepared in different ways among different parts of Karnataka.It is also our family favorite and is a perfect delight for spicy and garlic lovers.Actually Usli is made up of tender avarekallu(hyacinth beans) which is available only in season and is also a great curry for avarekallu lovers.Though the Usli made up of fresh and tender avarekallu and tastes the best ,but those beans are available only in season,so we do the usli with fresh green peas which are easily available through out the year in India.In our house Usli is prepared in slightly a different way which I will try posting even that version soon.The version I am posting today is done in the way of northern parts of karnataka which is equally yummy and perfect with chapathy's.Try it out at your place to enjoy our family favorite curry. Slightly roast jeera and methi seeds until warm,cool it and grind it to a powder. Heat butter and oil in a pressure cooker and crackle mustard seeds and add green chillies and fry until they change their color. Add curry leaves,ginger and garlic paste and fry well. Add chopped onions and fry until they turn translucent.Now add fresh green peas to it and fry well. Add ground jeera-methi powder,grated fresh coconut,salt,chopped fresh coriander and fry for a couple of minutes. Add 2 spoons of water and pressure cook for 1 whistle.After you open the cooker add freshly squeezed lemon juice to it. Serve it hot with hot chapathy's/Roti's. Usli tastes best with fresh and tender avarekallu.So do not miss trying this in avarekallu season.Just replace fresh green peas with those tender avarekallu and follow the same procedure. Usli can also be prepared with the soaked whole green moong/green moong sprouts following the same procedure and is much more a healthier option. 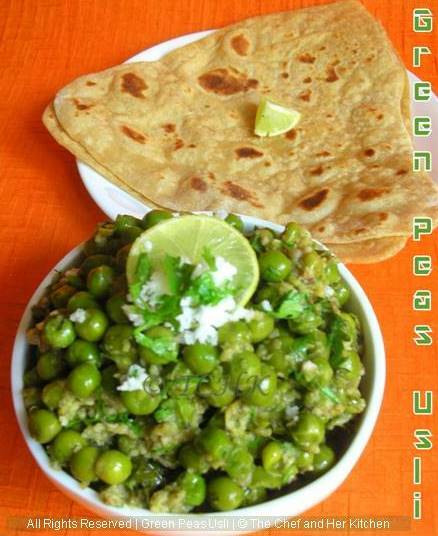 Use only fresh green peas instead of frozen one's to enjoy the fresh and tasty Usli. Avoid butter in the recipe for a Vegan version. Usli with green peas looks very refreshing! That looks so tempting....the click is fantastic...love the usli! Yummm!! 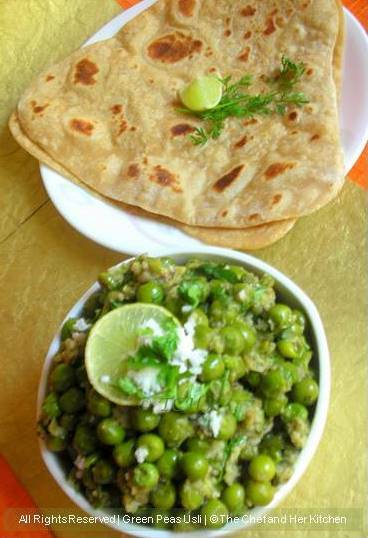 green peas usili makes me hungry...eyecatching side dish Prathy, seems a prefect side dish for rotis.. 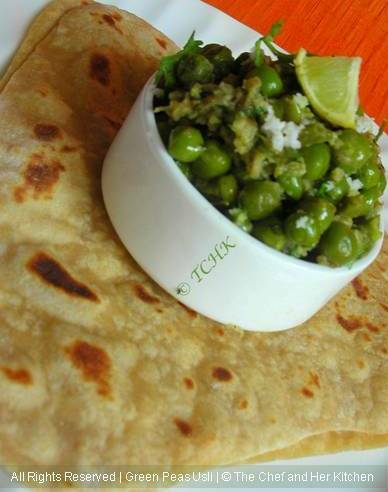 The peas recipe is new to me....don't I love those layered triangle parathas! Looks good and we call these varieties as sundal..grinding jeera and methi are different will surely try it out ....But perfect combo, and perfect for the event. Usli looks so delicious, Pratibha! Love the color of the dish. wow! Sounds great! Thanks for sharing! i love such usalis especially for tiffin..they make such a nice meal..love the clicks..
Peas usli and rotis mmm I wish I was there to grab the platter and in no time it would clean like a fresh one!!! Usli looks so mouthwatering prathibha yummmm beautiful pic. My Blog baby turns ONE Today...!! !